The confluence of Apple, Internet privacy and terrorism proved palpable on social media today after Apple CEO Tim Cook authored a letter explaining why the company was fighting an FBI request to create a security "backdoor" to iPhones. The development proved that Apple doesn't need to push its announcements via social media to generate major chatter. Cook's letter, posted on Apple's website, described his intention to fight the FBI's court order to disable the iPhone's auto-erase function, which removes all data from the mobile device after 10 failed attempts to break into it. The FBI's demand was related to a phone belonging to Syed Rizwan Farook, the San Bernardino, Calif., shooter who gunned down 14 people on Dec. 2 and is suspected to have been an ISIS sympathizer. When the news peaked at 6:42 a.m. Wednesday, "Apple" and "Tim Cook" were tweeted 2,246 times in a minute, per Spredfast's data. Those terms have averaged 607 tweets a minute, and more than 255,000 tweets on the subject have been sent today, according to Spredfast. Additionally, "Tim Cook" was a national trending topic on Twitter nearly all morning. Publicly rebuking the feds is no doubt buzzy in its own right, but also consider that Apple doesn't even post such announcements on social media. In fact, the online letter wasn't posted once by the company—Cook didn't even tweet it. Apple is famously socially averse, offering consumers only a Tumblr page and a few accounts for its music initiatives. It doesn't have accounts for chief brands such as iPhone and iPad, a starkly different strategy than most other large companies that try to pepper their names across Facebook, Twitter, Instagram, Pinterest, Tumblr, Snapchat and others. But big Apple news—iPhone, iPad and Apple Watch releases, for instance—seem to take hold on social channels nonetheless, speaking to the power of the brand. While the data around Wednesday's development is interesting, the potential weight of Cook's stance should not be underestimated. His decision to push back on the court order will have consequences for Apple and the tech world beyond. Companies like Facebook, Google and Yahoo have also reportedly been approached by the feds for data in order track terror suspects. In the letter to Apple's customers, Cook explains that the FBI's request is "for something we simply do not have, and something we consider too dangerous to create. 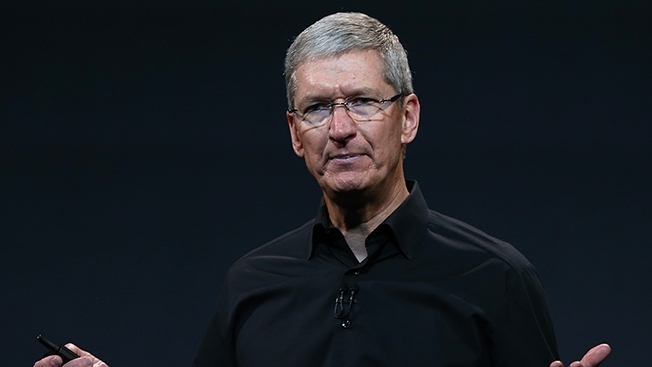 They have asked us to build a backdoor to the iPhone." Also in the letter, he wrote, "Specifically, the FBI wants us to make a new version of the iPhone operating system, circumventing several important security features, and install it on an iPhone recovered during the investigation. In the wrong hands, this software—which does not exist today—would have the potential to unlock any iPhone in someone’s physical possession."